In Part 1, I talked about the importance of setting aside power grabs and tapping into the skill sets of a variety of community personnel to establish a well-rounded wellness program for residents. Read on to discover a variety of ways your community leaders can work together to deliver best-in-class wellness programming to your residents. 1: A formal bridge program should be established between your community therapy and fitness departments to help residents transition from therapy to fitness and vice versa. Residents should feel supported in the collaboration that occurs between these two departments as their needs change. 2: Fall prevention and screening services can be offered through either department, but why not take a unified approach? Coordinate fall-prevention programs, lectures, health fairs, etc., and allow your therapy and fitness personnel to work side by side in addressing the variety of resident needs. 3: As special trips or events are planned for residents, activities personnel can sit down with the fitness and therapy teams to discuss the demands that will be placed on the residents for said activity. Allow your fitness and therapy personnel to promote the upcoming event and develop educational opportunities or training programs to help residents prepare. For example, if residents are going on a trip to a historical destination where they will be walking on cobblestone or brick sidewalks, programs could be offered to help them prepare for extended walking on the terrain, or a discussion on the importance of proper footwear, cane use, and more could be provided. 4: As fitness classes or programs are coordinated and room reservations need to be made, help show your residents that physical well-being is a priority by making rooms and promotional space on calendars and newsletters available to market these programs. After all, if you are going to regularly advertise Tuesday Afternoon Bridge Group on the calendar, why wouldn’t you equally advertise the Tuesday Morning Gentle Yoga Class? 5: Coordinate healthy cooking demonstrations for residents to help them learn how to order healthy selections in the dining room and then sample those healthy options at the demo. 6: You likely provide refreshments to residents at a variety of events. Consider serving cookies and punch as occasional treats and making healthy and engaging options for residents to enjoy. Allow them to create healthy smoothies or yogurt parfaits or create a DIY trail-mix bar with healthy options as you offer an afternoon seminar. Have members of your dining services team present so residents can better connect the healthy options flowing from that department with the educational lecture they are about to hear. 7: Fitness and health services staff could coordinate their weekly free blood pressure screenings to occur right outside the doors of where a well-attended group exercise class takes place. This may help capture more participants in this service and it may bring more awareness to the group exercise class by other residents simply looking to take advantage of the free screening. 8: If you have underutilized services available through your health services department such as home health care, medication assistance, and so on, speak with your activities personnel about doing a monthly highlight of the services in the newsletter or in a presentation. It’s often that residents don’t understand or don’t realize that a service is available to them more so than not being interested. Find opportunities to spread the message. You’ll notice that fitness isn’t included as its own separate header because it is already represented by collaborating with the other departments in the list. This remains NIFS’s philosophy on resident wellness programming. It’s how we support wellness for our clients, and we’ve found it to be an effective model that serves well the needs of current residents as well as contributes positively to community occupancy and viability in the marketplace. Want to learn more about how to build those key elements in your community? Join us for our Build Vitality webinar series. Part 1: Who Should Be Contributing to Resident Wellness? There are many interpretations of what a community “wellness program” should be, and to be fair, many interpretations are quite valid. We’re not saying one size fits all; quite the contrary. What we are saying is that there are multiple VALID interpretations of resident wellness and making your community aware of the potential variety (pulling away from “this is what we’ve always done”) will be beneficial for all. Tap into the unique skill sets of your community personnel to cultivate a harmonious and healthy lifestyle for your residents. For example, resident health services and therapy departments may perceive clinical programs such as health metrics screenings or gait analysis as wellness programming. Your activities personnel may perceive socialization and educational seminars as a wellness program, whereas your community fitness personnel perceive prevention programming such as balance training and healthy eating as wellness. The answer to which of these options is truly a wellness program is “all of the above”—if they are executed effectively with a collaborative approach to promote resident well-being. Oftentimes there are power grabs at play among community personnel on who is offering wellness or who should be involved in certain types of programming. We’ve written about silos and power grabs before. A well-rounded wellness program cannot truly exist until these power grabs are set aside and everyone learns to contribute to the greater good of resident care and well-being as a team. After all, how long will a resident truly be successful upon discharge from therapy services if they don’t have the support of fitness programming to continue their progress? Or what good is an educational lecture on the importance of managing your blood pressure as coordinated by your activities personnel if health screenings and clinical support are not available? The needs and expectations of today’s residents are too dynamic and unique to have a “wellness program” facilitated through the vision of one department or one individual. To best serve the needs of residents, all departments should be contributing their own skill sets under a central mission for improving resident well-being. In doing so, your community will be able touch on many different dimensions of wellness from one department to the next without placing the entire programming burden on one or two individuals. In turn, the scope of possibilities in programming is not as limited and a current of wellness-based lifestyle programs and options will flow from one department to the next. If you were to remove one of these departments, it would likely create a gap in your program. This collaboration can demonstrate to existing and prospective residents that individual agendas and power grabs are not the priority at your community, but improved resident well-being through collaboration is! You won’t want to miss part 2 of this blog, in which we look into eight specific examples of where your key community players can contribute to well-rounded wellness programming. We see it all the time – fantastic retirement communities with diverse and enriching wellness programming for their residents, but lacking a unified banner to pull it all together. Instead, the programming is a little bit hodge-podge and lacking in a strategic focus. And senior living wellness professionals, because their busy and pulled in 100 different directions, are missing out on opportunities to capitalize on these engaging wellness activities. 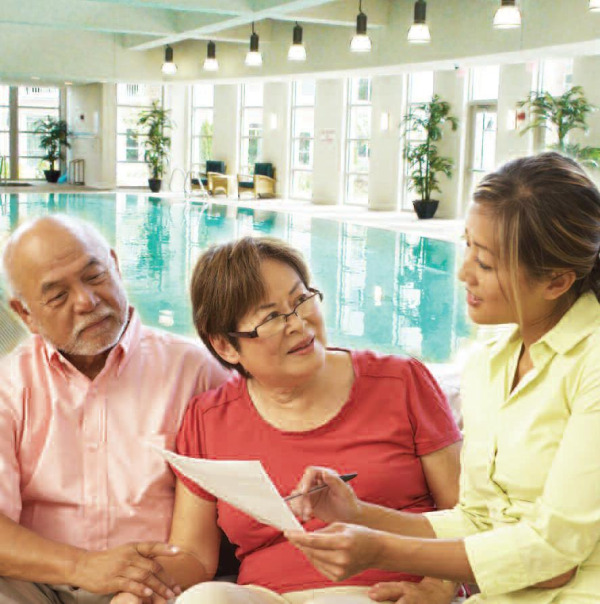 What is your senior living community’s wellness strategy missing? Are you able to capture stories of how your wellness services are positively impacting the lives of your residents? Is your marketing and sales staff able to effectively articulate what it means to live vibrantly in your community to prospects who may be reluctant to leave their homes? Do you have a wellness brand that is well-executed through the community within multiple departments, through a variety of personnel? If you didn’t answer a resounding YES to all three of those questions, then check out some of the key strategies below that we offer our clients who are working on building a better wellness brand. Begin with the end in mind: When you’re just getting started considering the brand you want to develop for wellness at your senior living setting, it is sometimes helpful to think about the end point. Consider what you want to communicate and how that should look. Once you are able to define that end-picture, you can start working backwards on what needs to be developed, designed, created, and transformed. Identify and leverage existing successes: Think about what is a huge success at your community? What do your residents buzz about over and over again? What kinds of events, programs, or services get the greatest participation? Those offerings may provide you with a jumping off point for considering your wellness brand. Giving thought to the stakeholders in your community who need to be at the table for these discussions also is part of this consideration. Use the wellness dimension model to look for programming holes: Start by writing down all the dimensions (physical, emotional, social, environmental, intellectual, vocational, spiritual) and list out all the programs you’ve run in the last six to 12 months. Then put the programs into the wellness dimension buckets where they belong. (Most initiatives will fall into more than one dimension.) This simple mapping technique should help you identify where you may have some gaps in services. It should also show you low-hanging fruit opportunities for early success in your branding efforts. To learn about two more strategies as well as some tactics for executing on your wellness brand, view our “Build a Better Wellness Brand” webinar using the button below. If you want to cut to the chase and access all four of our Build Vitality webinars, click here.